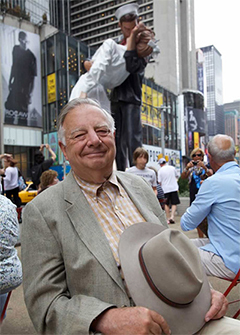 Seward Johnson’s impact on the world of sculpture has not been limited to his personal artwork, and includes the founding of The Johnson Atelier and the founding of the spectacular Grounds For Sculpture. 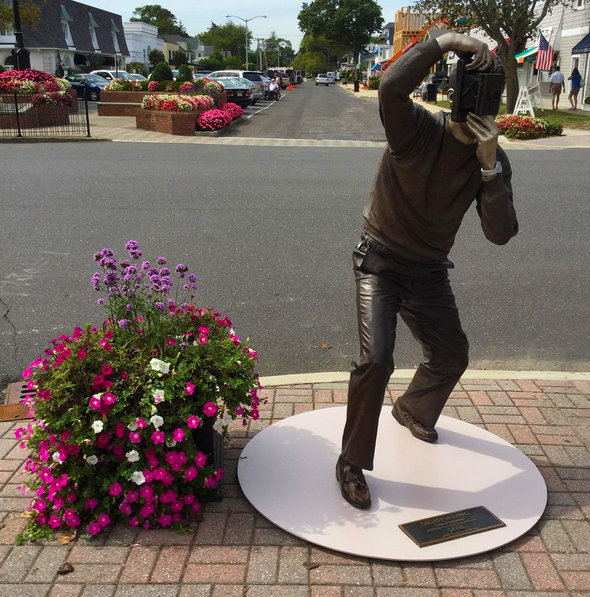 Inducted in 2014 into the New Jersey Hall of Fame, the artist regularly adds works to all of his series, and invents intriguing new chapters of his oeuvre. 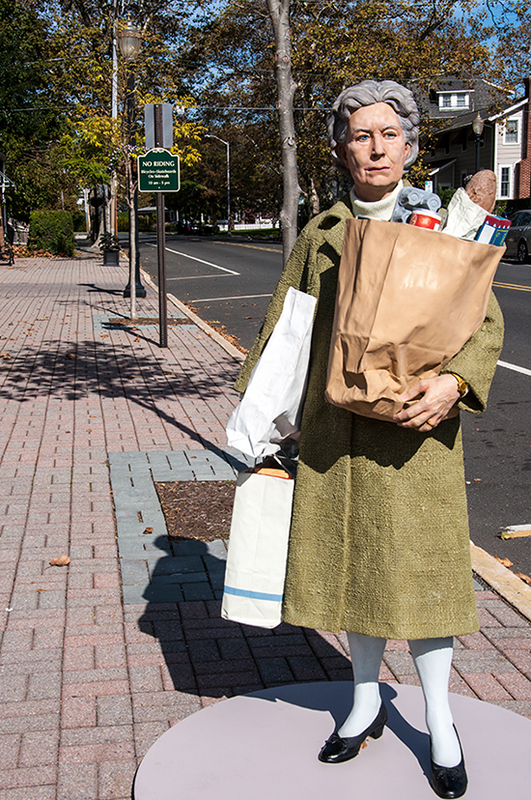 At 89, Seward Johnson continues to create increasingly memorable works for the public realm. Johnson’s lady with her groceries is a clear favorite from the Celebrating the Familiar series. The incredible detail of her face, hands (note the wrinkles) and the bounty in her bags, make her one of the sculptures that can be examined for details over many visits. 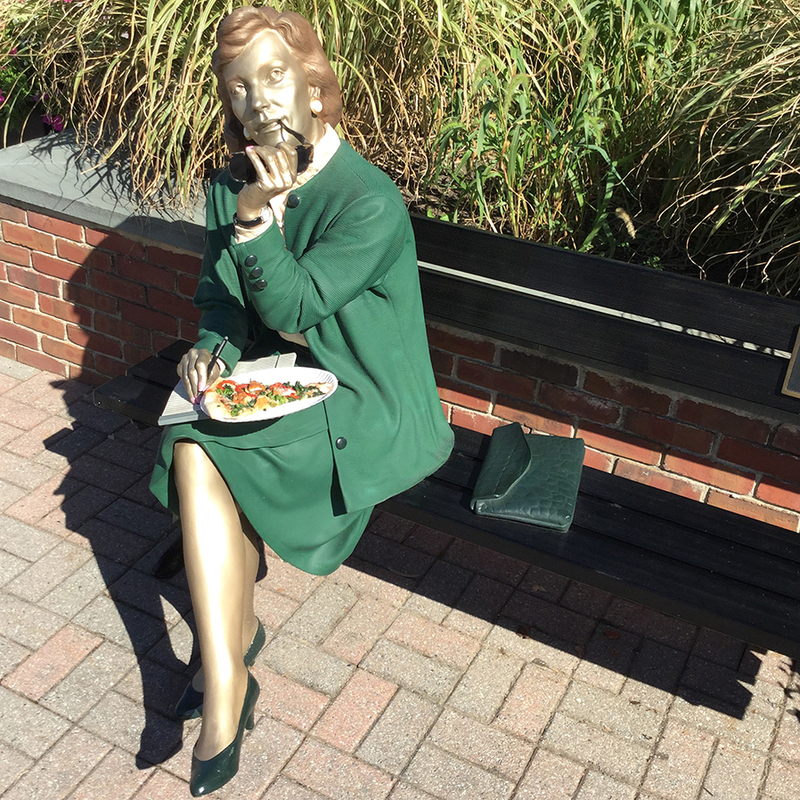 Holding Out by Seward Johnson ©1987 The Seward Johnson Atelier, Inc. 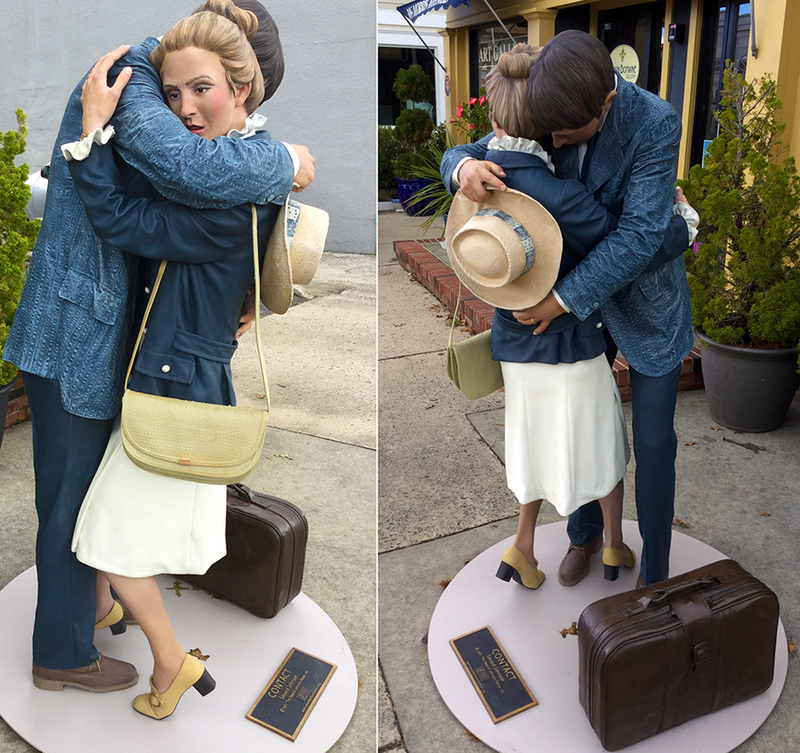 In this piece, Seward Johnson brings to life one of the most famous paintings in American history. Painted in 1930, American Gothic was Grant Woods’ celebration of the moral virtue of hard-working Americans, symbolized by the farmers. Because of its many interpretations and the riveting portraits, the piece has gone on to become a widely parodied image in pop culture. The presence in Johnson’s series called Icons Revisited reflects this widespread attraction, and asks the viewer to examine what facets of the image have created such broad appeal. 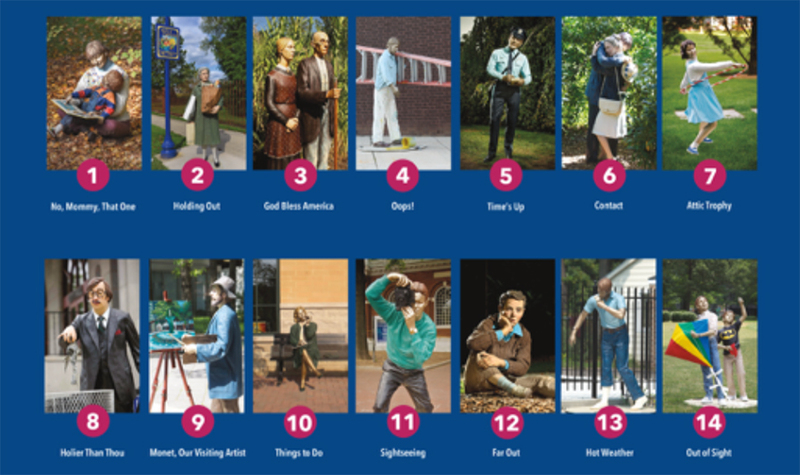 Additionally, the question presented by Seward Johnson is – has there been a change in perspective since this iconic painting was made, and what are the shifts that have occurred?When Johnson re-imagines a classic artwork, he adds his own transformational message. 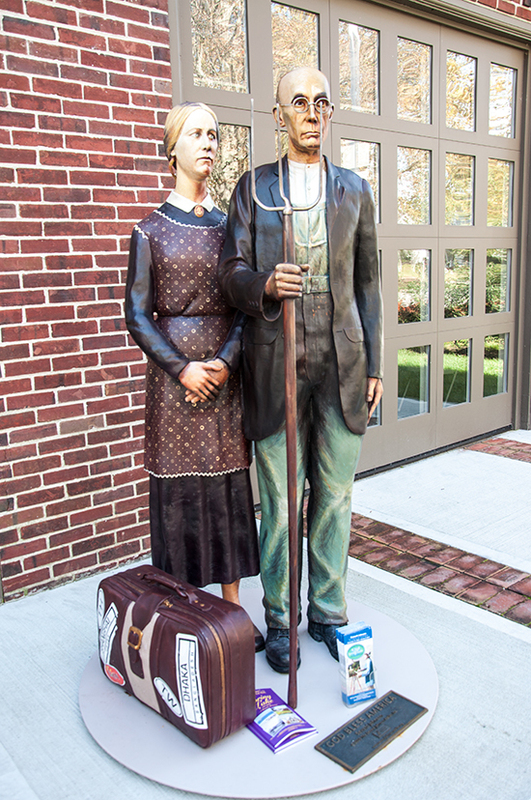 The depiction of these two American farmers in his three-dimensional work is accompanied by a suitcase (not in Wood’s painting), with stickers from many of the overseas outsourcing capitals. Johnson uses this addition of the suitcase to comment on the loss of jobs in America to overseas production. Today, there is a prevalence of outsourcing of US jobs in the fields of agriculture, manufacturing, and other fields. Johnson invites viewers to see these farmers, and their stern countenances, from the perspective of modern day and asks us to take a closer look. 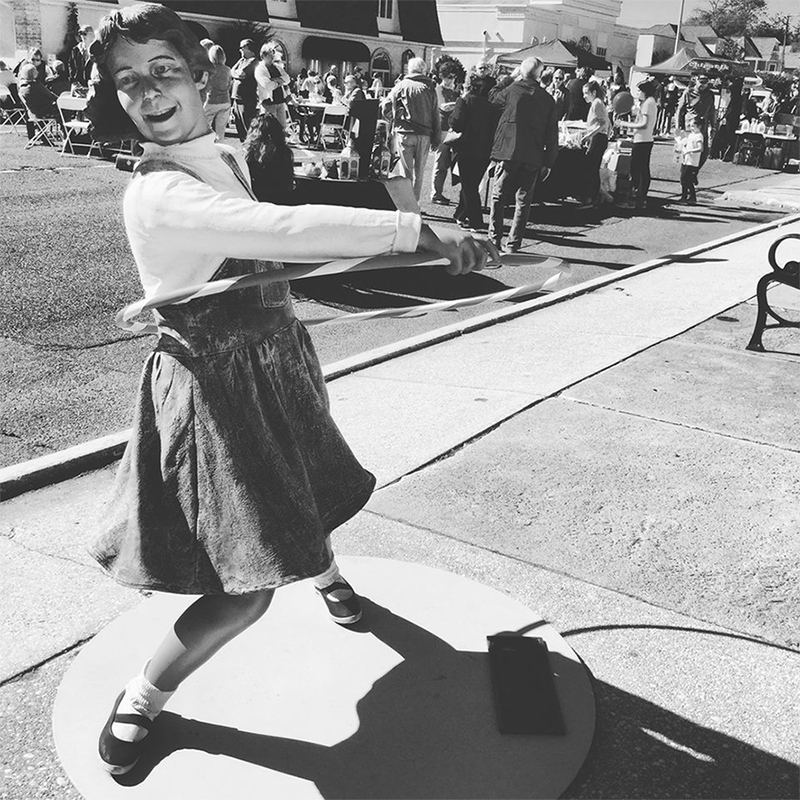 A mother reading to her child can be a saccharine scene, and Seward Johnson wanted to show this wriggling toddler to bring reality into the pose. He is sharing that such scenes are not always a Hallmark card moment by bringing forward the insistence of the child, and his individual wishes. Sometimes Johnson’s pieces function as models, or “sign posts” for recommendations such as sitting on a park bench reading a good book, or taking a nap. In this case, it takes the recommendation a step further and features a persnickety-looking man taking the responsibility for some litter. This boy epitomizes the summer day – ice cream dripping, having just jumped off his bike (note the pant leg tucked up to avoid the bike chain). What could be better? This woman on a bench takes her list writing out into the sunshine to make the task more pleasant. You get a hint about her life by reading what her “to dos” are. 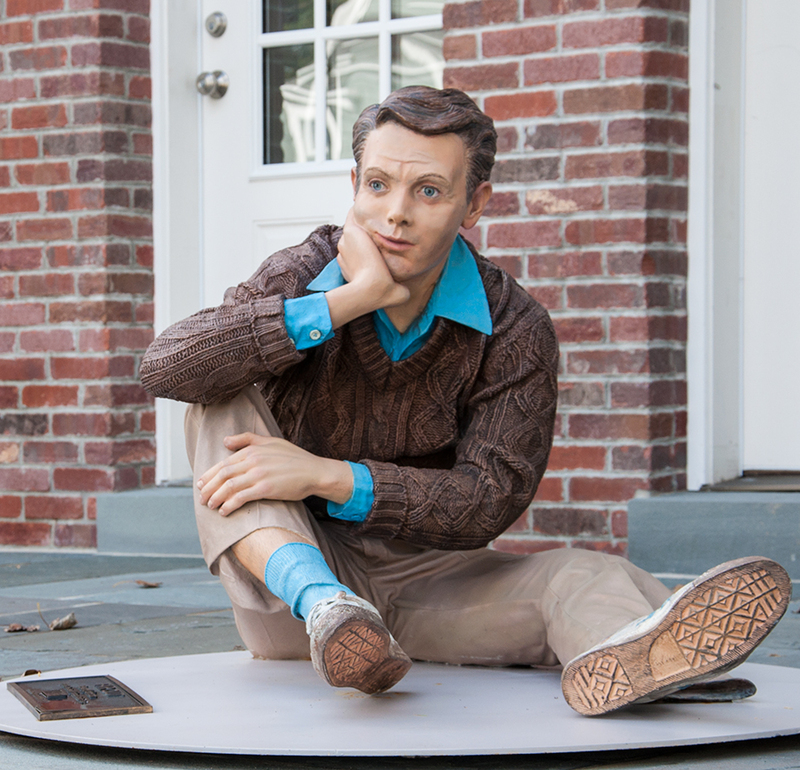 A painter all his life, Seward Johnson began sculpting in 1968. 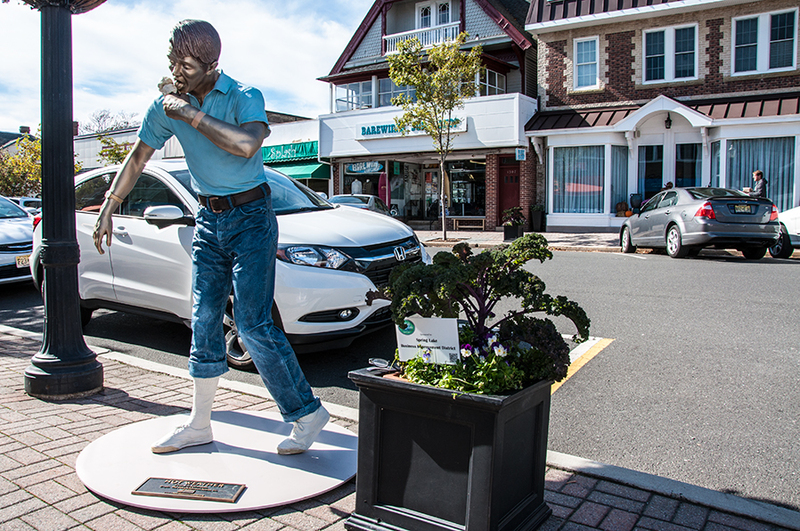 Since then he has gained international renown for his highly realistic, life-sized bronze figures depicting day-to-day life situations and activities. Sometimes these works even provoke a double take and a momentary fool of the eye.The work titled “Monet, Our Visiting Artist” depicts a sculpted full figure portrait of the beloved painter Claude Monet (1840-1926), and was originally created as an homage to Monet painting “Terrace at Sainte-Adresse.” The bronze figure has since been shown “painting” other Monet inspired sculptures as a playful “art imitating art imitating life” scenario, and when on exhibition, Monet is usually painting a familiar local scene before him. 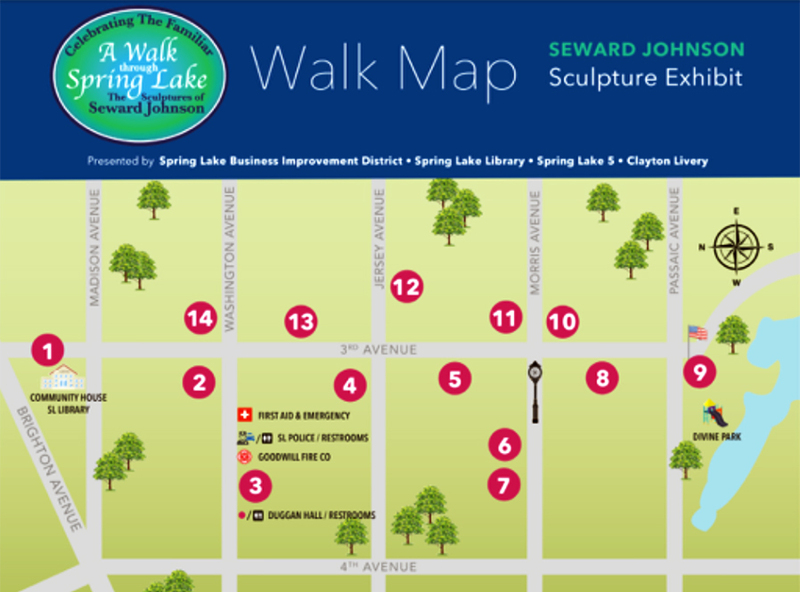 Seward Johnson, the sculptor, says: “I think that becoming a father has profoundly affected my work. It has softened me and made me more aware of the innermost parts of people”. The Johnsons have both a son and a daughter. As Seward Johnson’s works so often are the subject of photographers’, here the artist turns the tables and points the camera at his viewers. Note how camera technology has shifted since this sculpture was created. This couple is evidently parting – note the suitcase – and Johnson wished to convey that particular feeling of yearning when two lovers part to go their separate ways. 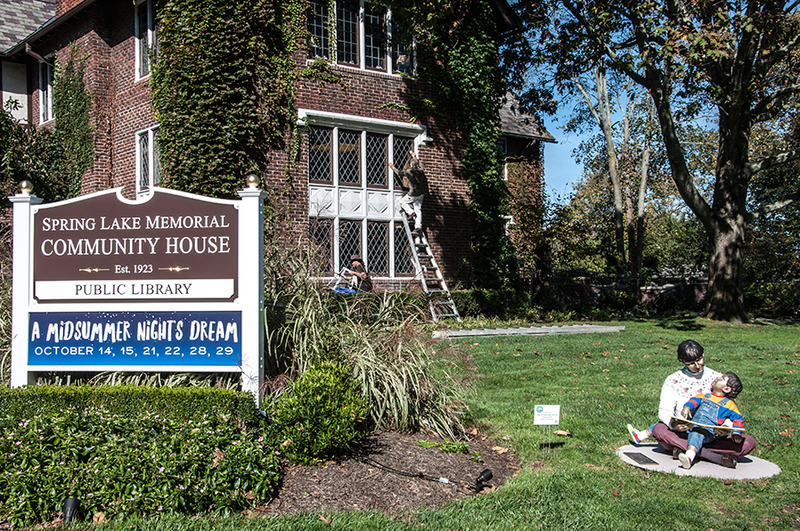 Installation taking place in Spring Lake, New Jersey in the middle of September! Come see the show, now thru Jan. 1, 2017.